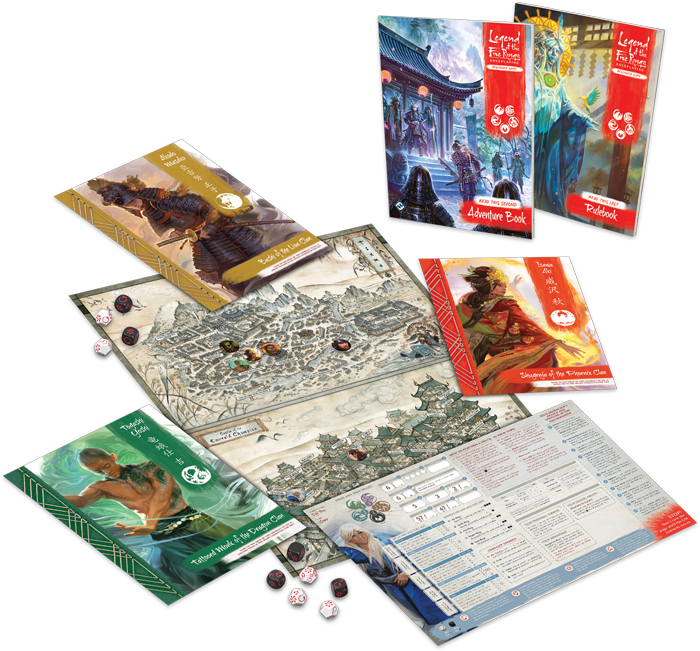 The world of Rokugan is at your fingertips with the Legend of the Five Rings Roleplaying Beginner Game! Not only does the game serve as an introduction to the Emerald Empire, but it also gives Game Masters and players the tools they need to jump into the action. 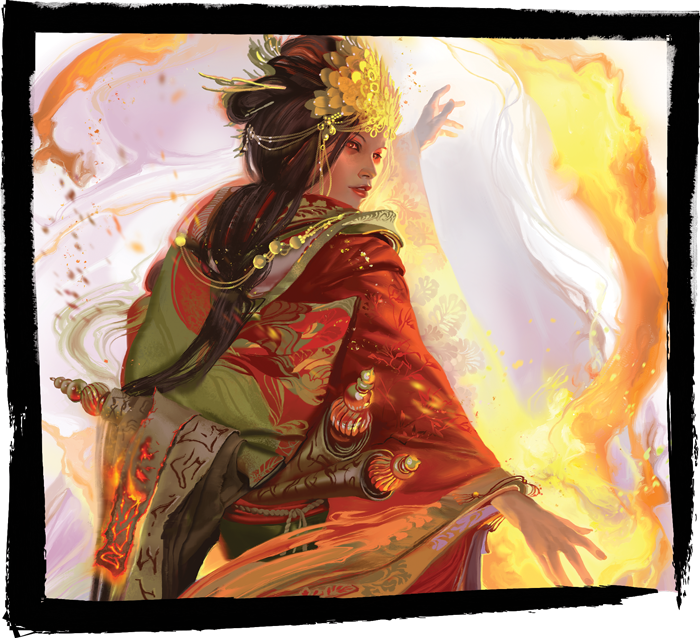 With a pre-made adventure and various tokens and maps that bring Rokugan to life, there has never been a better time to start roleplaying in Legend of the Five Rings! One of the biggest assets that the Beginner Game provides is four different characters that you can roleplay during your adventure. Making your own character can be intimidating, and these folios not only give players a handy reference to the rules of the game, but they also allow you to jump right into the action without being overwhelmed by mechanics. However, this certainly doesn’t eliminate the choice of character for you! Each character has a unique play style and backstory, and each will appeal to a different type of player. 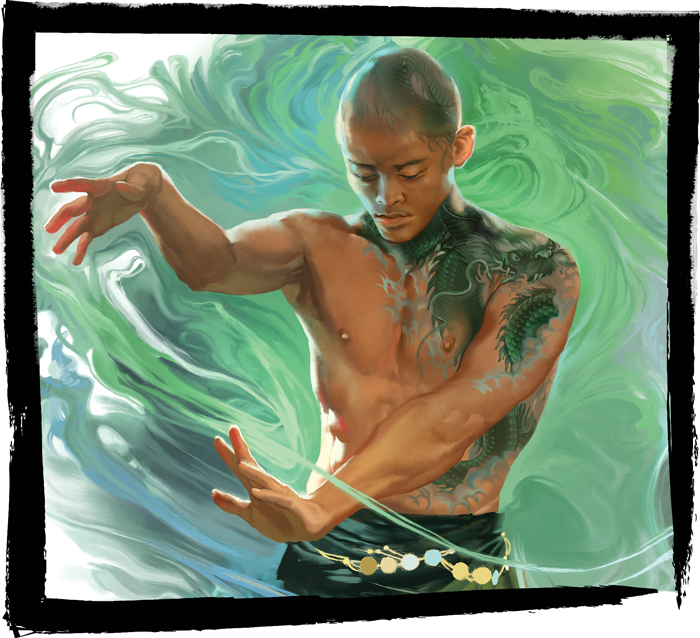 Join us today as we examine two of the heroes of the Topaz Championship in the Legend of the Five Rings Roleplaying Beginner Game! If you seek the path of the Dragon, the young monk Togashi Yoshi is just beginning his journey. Yoshi was surrendered to the Togashi Order as a young child by a man claiming to be his uncle. Orphans weren’t uncommon in the monastery of his youth, and the monks who raised him were welcoming, but still Yoshi has always felt the lack of personal connections, even as he tries to put aside earthly desires. Perhaps it was this desire for connection that led him begin his relationship with Kaie, a senior student at Yoshi’s monastery. Their love was deemed inappropriate by the masters of the monastery, and Kaie was sent away to another temple, while Yoshi was assigned to study under Togashi Tadakatsu and sent on a pilgrimage through Dragon lands. While traveling with Tadakatsu as a pilgrim, Yoshi at last saw the stark divisions in life between peasant and samurai. He asked his mentor why the two peoples were treated so differently, given that Yoshi could see no difference between them. His mentor only shrugged, and said that there was no difference, only people struggling to climb Shinsei’s karmic ladder toward Enlightenment. The teachings of the Perfect Land sect are similar to this sentiment, and although many hold that sect to be heretical, Yoshi thinks there could be wisdom to be found here. Now, Yoshi has been dispatched to the Topaz Championship at the personal request of Togashi Yokuni, the inscrutable Champion of the Dragon Clan. It is rare that a monk of the Togashi order would bother with the gempuku—passage to adulthood—ritual of the samurai class, but such is Yokuni’s will. Now, perhaps, Yoshi has a chance to help those less fortunate than he was, and find his place in the world. Togashi Yoshi is a monk of the Dragon Clan, and excels in athletic feats. He is a good choice for a character if you prefer to act with compassion and wield the power of mystic martial arts. As a member of the Dragon Clan, Yoshi often reflects on enlightenment and the various paths used to achieve it. Yoshi is not a good character pick if you would prefer a hot-headed character, and want to use weapons of war or the power of the elements in combat. 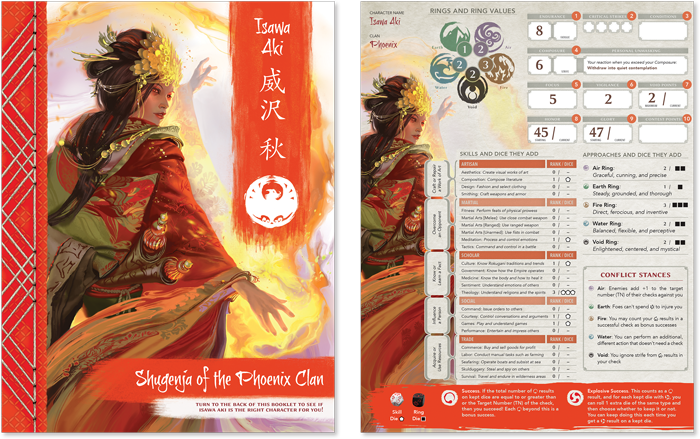 Joining Yoshi on the adventure is Phoenix Clan shugenja, Isawa Aki. Aki showed her ability to hear and speak with the kami—the mystical spirits of Rokugan—at a young age, and she was soon apprenticed to Isawa Juriko, a powerful shugenja who some suggested might one day become the next Master of Fire. Aki took to her studies with great passion, and found a kindred soul in her mentor. Indeed, soon Aki was making contributions to Juriko’s work, urging the elder shugenja to press further in her studies and understanding of the kami. Unfortunately, something went wrong, and Juriko died in a horrible fire. Since then, Aki has been without a proper mentor, completing her studies on her own at the temples and libraries of the Isawa. Here, she learned more of the heretical Perfect Land sect, and she firmly believes their teachings of false equality are dangerous and can only bring ruin to the Emerald Empire. Now, Aki is ready to undertake her gempuku trials and become a full, adult samurai. As is only proper given her extensive natural gifts, Aki has been selected to travel to Tsuma and join the Topaz Tournament. Aki is certain that Juriko’s fate is not what awaits her. Soon, Aki will not only reach her old mentor’s level of mastery, but exceed it. Becoming Topaz Champion is only the first step. As a member of the mystical Phoenix Clan, Isawa Aki has the unique ability to commune with the kami. If you want to command the elements with overwhelming force, this Phoenix shugenja may be the perfect character for you. If your focus is more on the physical realm of words and steel, you may look elsewhere when choosing a character. These are just two of the characters featured in the Legend of the Five Rings Roleplaying Beginner Game—joining these two on their journey are the Lion bushi Akodo Masako and Crane courtier Doji Ren. From an enlightened martial artist to a commander of the elements, from the pinnacle of grace to one who wields the weapons of war, nearly every kind of play style is represented. Each of these characters has their own strengths and weaknesses! 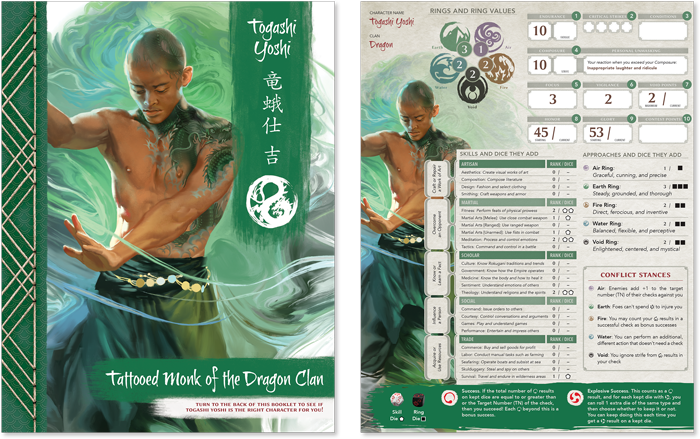 And if you still don’t find your perfect character, be sure to check out the Fantasy Flight Games website for three more downloadable folios representing the Scorpion, Crab, and Unicorn Clans, launching alongside the Beginner Game! Between these seven characters, you'll find a member from every Great Clan represented at the Topaz Championship in the Legend of the Five Rings Roleplaying Beginner Game! 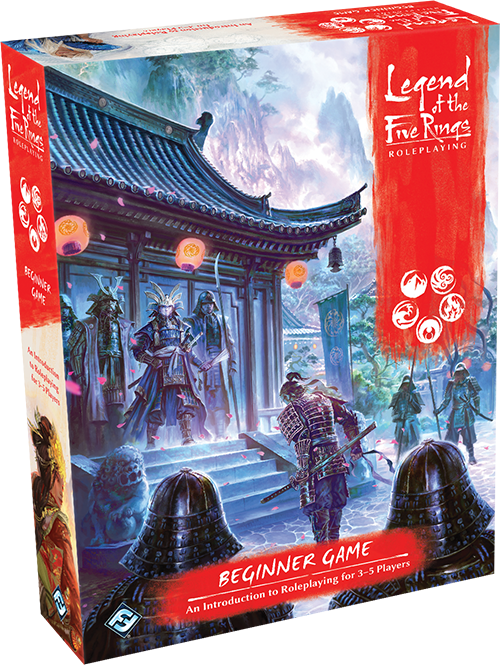 Fight for victory in the Topaz Championship with the Legend of the Five Rings Roleplaying Beginner Game (L5R01), available now for pre-order from your local retailer or our website, and releasing August 9, with an early release at Gen Con 2018!